You will have seen the ballot results sent round by UCU HQ. Only 7 out of 147 Branches made the 50% legal threshold (it’s hard work!). HOWEVER, if you aggregate the results, there was a 42% national turnout with a nearly 70% vote for strike action. This is the best result that UCU has ever achieved in a national pay ballot. @ucusurrey got very comfortably over this national average with its 44% – something to be proud of. Why do we keep emailing about Pay? Pay is not really about Pay. Pay is about the race to the bottom. We saw it with USS. Employers argued that other organisations in the private sector have pushed their employees into gambling their pensions on the stock market, so why shouldn’t HE institutions? As for the current 2% Pay offer – if you are paid a lot less than inflation for 14 years, you are in the race to the bottom. At some point, this race has to stop. Other hurdles as HE employees lap the downward track – contracts that are increasingly precarious, casual, insecure. The gender pay gap drags on. Workloads are increasingly stressful. All of these issues were raised in the 2018/19 UCU Pay and Equality claim. They are the reasons we are now in dispute, and they ARE OUTLINED ON YOUR BALLOT PAPER. Why do we keep talking about 50%? If we do not reach the legal threshold of 50% voting turn-out as a Branch we will probably be RE-BALLOTED. We can not take any legitimate action without reaching this figure. We will not be able to join the other 147 balloted Branches who will be strengthening our collective negotiating power in an attempt to improve the employer’s offer. So Pay is not really about Pay. And your vote really does matter. Please vote and let us know today. The JEP Report is out! If you went on strike, if you braved those cold pickets, if you were the lone member in your department not in work during the dispute – read the exec summary of the JEP Report (it is a lot shorter, accessible, and very well written). This is your document, an outcome of your action, and remember, if it wasn’t for the action – you would have a defined contributions pension scheme winging its way into existence instead of a report that validates the original UCU arguments against the proposed changes to the scheme. Tide-turners include: the unique position of HE as a sector and the need for long-term thinking as a consequence, the strength of USS as a scheme, the faulty consultation process with employers, and the need for more cohesive consultation with members (i.e. you!). A sigh of relief. And the first important step in a long process. We still have further to go in Phase 2 of the current JEP remit. However, it is time again to thank all those who made sacrifices last Spring so that voices could be heard and staff provisions defended. Get in touch with your views and let us know what you think. We have shown UUK that collective action works over pensions, now let’s show UCEA over Pay! During the period in which UCU have been consulting about the Captured Content Policy, there have been some important and positive changes. These include that recordings cannot be used without consent, including during strike action, and that there is no staff appraisal metric associated with the use of captured content. Feedback shows that members are prepared to use captured content in their modules, but concerns remain about time constraints; availability of support; and “enforcement” of teaching approaches. Although the Policy stipulates that Panopto use is not compulsory (this is not legal) it is anticipated that teaching staff may be under huge pressure to provide recordings of their lectures. What the policy means for you depends on what your Department or School decides to do. • The Policy aims to develop local practices that are acceptable and realistic. All teaching staff should have some input into these decisions – however if staff in your department are being frozen out of such discussions then please let us know – this is not the intention of the Policy as we understand it from meetings with TEL. We hope this helps, we will continue to be in touch on this issue. We are aware that members are concerned as to the impact that strike action may have had on MEQ scores, and the subsequent use of these scores within upcoming appraisals. 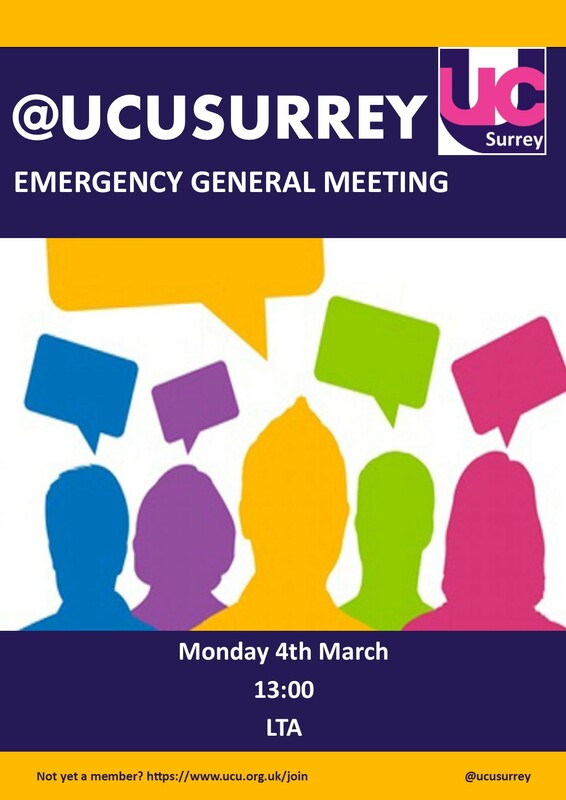 The Surrey UCU Committee advise that it may not be necessary to take action unless you anticipate your manager downgrading your appraisal. You may wish to note on your appraisal form that MEQs may be lower than usual because of legitimate strike action they have taken. If any punitive scoring or comments arise from the appraisal due to low MEQs from students who were affected by industrial action, we will challenge this on the basis that the member of staff is receiving detrimental treatment as a result of union membership, which is unlawful. We are therefore advising members to keep in touch and keep us informed of any detrimental consequences. We will offer further advice nearer to the appraisal round. Please let us know if you become concerned that your appraisal may suffer because of strike action you have taken this year (i.e. for any role; not just that relating to MEQs). UCU calls on University of Surrey senior management to drop 100% deduction for action short of a strike. As you may know, university staff at 64 institutions are currently engaged in industrial action to defend their pensions against the drastic cuts proposed by UUK. University of Surrey is one of these 64 universities. Unfortunately, as far as UCU is aware, the University of Surrey is one of only a tiny handful of universities planning to deduct 100% for action short of a strike. 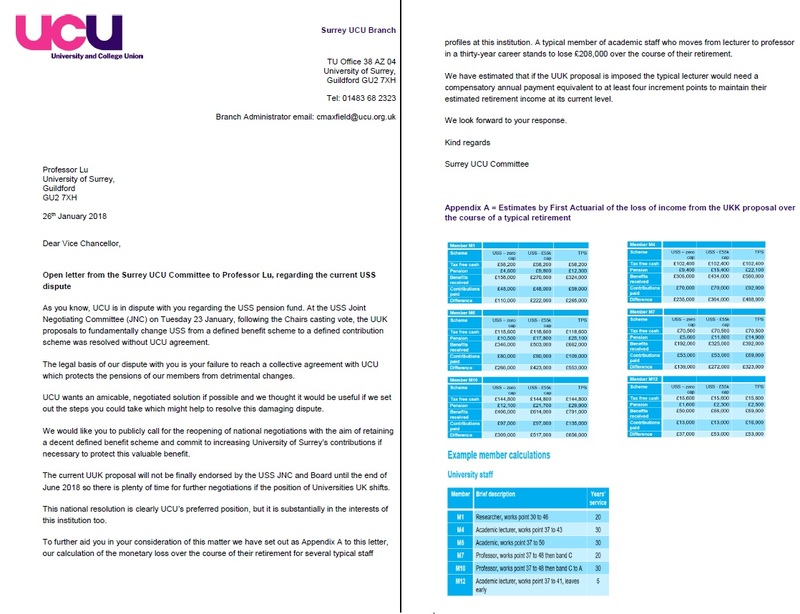 UCU is calling on the University of Surrey senior management to drop their punitive plan to deduct 100% from wages for refusing to reschedule lectures or classes, or to cover the work of absent colleagues as industrial action short of a strike (ASOS). Surrey UCU reached the 50% turn out threshold and will be participating in strike action. Following our last Union Executive Committee meeting (9th January 2018), I am writing on behalf of the Students’ Union in relation to the current dispute over USS pensions, which risks a considerable reduction in the retirement benefits staff may receive. As a union, we believe that all academic staff have a right to job security, and that fair pensions are a part of this security. Whilst we do not wish at this time to take a position in relation to the University or local branch of UCU on this dispute, we strongly feel that it is in the best interests of students at the University to minimise the disruption which would result from sustained strike action. As the Executive Committee discussed, the current pensions dispute stands to significantly disadvantage current students who may pursue a career in higher education. Furthermore, academic staff at the University are vital to not only the growth and wellbeing of our students, but are fundamental to their time here at Surrey. With these thoughts in mind, we would like to ask that you, in your position as one of the most prominent Vice Chancellors in the UK, publically outline the position that you have taken within UUK regarding the pensions dispute. Further to this, we call upon you to use your role within UUK to support a swift, mutually-agreeable outcome from the dispute.